The Maltese is a very popular dog breed due to their playful nature and gentle manner, two characteristics shared by most Maltese dogs. Maltese belong to the AKC Toy Group of dog breeds due to their small size, usually ranging from 4 to 6 pounds. The breed itself is thought to have originated from the Mediterranean island of Malta, originally being known as 'Ye ancient dogge of Malta'. The breed name Maltese was chosen by the American Kennel Club in the late 19th century because of the breeds ties to the island of Malta. Maltese have always been prized as family pets because of their desirable traits and characteristics. The breed has been a favorite of aristocrats for many centuries. Unlike many other breeds, the Maltese breed has remained relatively unchanged for many centuries. We may be a little biased, but we think that this is because Maltese are perfect just the way they are! The oldest record of the Maltese breed comes from ancient Greek writings as far back as 500 B.C. It was mentioned in several Greek literary works that the Maltese dogs were a favorite of the noble women of Greece. Over the centuries, the Maltese breed has been crossbred with other breeds to try to create improved breeds, and the Maltese breed nearly disappeared in the 18th century because of this. However, the Maltese breeds survived and has continued to be a very popular breed ever since and remains one of the most popular small dog breeds. The Maltese breed still has desirable characteristics and traits that breeders contine to use the breed to create other breeds, such as the Pekeatese, Malshi and the Morkie. In order to be considered a purebred Maltese, puppies must have a pure white coat. Some breeders will market parti colored puppies as being Maltese, but these are generally crossbreed dogs. Light tan coloring is permissible by dog registries, but that is generally considered to be an undesirable trait or characteristic in Maltese puppies. To see the Maltese puppies we currently have available for sale, please scroll to the bottom of this page. An interesting trait of the Maltese breed is that Maltese puppies are described as having a hypoallergenic coat, which is another reason that purebred Maltese make a good pet. The Maltese coat is long and silky and lacks an undercoat. Maltese hair should be straight and not curly or kinked, as you might see in a similar breed like the Bichon. Even with their small size, Maltese puppies are recognized as being quite fearless. Maltese are also quite lively and playful, and will maintain this characteristic throughout most of their life, remaining quite vigorous. The Maltese breed has been bred over the centuries to be cuddly companion dogs, as that has been their main role through the breed's history. Maltese thrive on the love and attention of their owners. 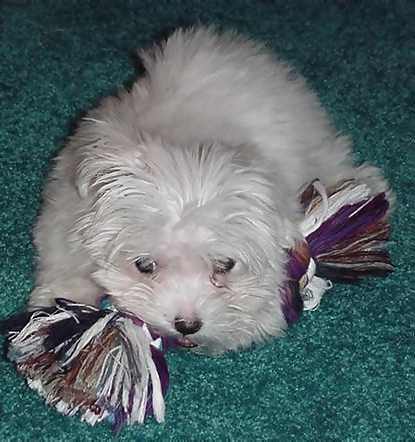 Maltese are also quite intelligent and are very fast learners, making them easier to train than some other breeds. Maltese are one of the most gentle mannered of all dog breeds, but are also very playful, making them great with small children. All of these characteristics make Maltese puppies great family pets. As with any dog, the best way to learn about the temperament of a Maltese puppy is to spend time with the puppy. The temperament of a puppy is based off of many factors, including the parents and the environment in which the puppy is raised in addition to the breed of the puppy itself. Spending time with the puppy will help you learn more about that specific Maltese puppy's temperament. As a small dog, purebred Maltese make great house pets and are great apartment dwellers, as they need only limited exercise. Their refinement and cleanliness make them popular choices as companions. As a small dog, they are also more convenient to travel with and are known to travel well. As mentioned, Maltese have a very playful and affectionate temperament, but they do need daily interaction to thrive, as they feed off of the love and attention of their owners. Maltese are also one of the most gentle mannered breeds, making them great family pets. Maltese puppies do require periodic grooming if you keep your Maltese with a longer coat. However, if the Maltese's coat is trimmed, only minimal grooming is required. Below are the Maltese puppies that are currently for sale or adoption. If the Maltese puppy you are looking for is not currently available for sale, you can join our puppy waiting list to be informed when new Maltese puppies are for sale. You can also view the other puppies that are currently available for sale. If you have a general question about the Maltese puppies that are for sale or adoption, or any questions about Maltese puppies, you can contact us and we will be happy to answer your question. Currently we do not have any Maltese puppies available for new homes. Please join our puppy waiting list to be informed when we have new Maltese puppies available for sale. Thank you for looking! We are located approximately 2 hours from the downtown Kansas City Kansas, Kansas City Missouri, Omaha Nebraska and Council Bluffs Iowa metro areas. We also serve customers in Topeka, Manhattan, Lawrence, Overland Park, Olathe, Wichita, Shawnee, Hutchinson, Leavenworth, Leawood, Emporia, Prarie Village and Salina Kansas, St. Joseph, Independence, Lee's Summit, Blue Springs, Liberty, Gladstone and Raytown Missouri and Bellevue, Grand Island, Kearney, Fremont, Hastings, Columbus and Lincoln Nebraska. We have Maltese puppies for sale in Kansas, Maltese puppies for sale in Nebraska, Maltese puppies for sale in Iowa and Maltese puppies for sale in Missouri.